Pallant House Gallery’s latest exhibition, Introducing Bomberg: A Master of British Art, provides the first large scale reassessment of this neglected British artist’s work in more than a decade. It considers the overarching influence of David Bomberg’s Jewish identity on his painting as he journeyed from radical abstraction to expressive, painterly realism. The exhibition is the inspiration of Ben Uri Gallery curators, Sarah MacDougall and Rachel Dickson. It brings together work from the collections of Pallant House Gallery, The Ben Uri Gallery, Tate and others. The show has a strong chronological narrative which places Bomberg’s paintings firmly in the context of his life and the times in which he lived. David Bomberg was born in Birmingham in 1890. His parents were Polish-Jewish immigrants. He spent his formative years in London’s East End. There he worked alongside his fellow Jewish ‘Whitechapel artists’, Mark Gertler, Jacob Kramer, Clare Winsten and the poet-painter Isaac Rosenberg. Bomberg studied at evening classes under the Camden Town Group leader, Walter Sickert, before attending the Slade. He was considered an innovative artist. Bomberg was connected with the European artistic avant-garde. In 1914, together with the sculptor Jacob Epstein, he curated a Jewish section at the Whitechapel Art Gallery’s exhibition ‘Twentieth Century Art: A Review of the Modern Movement’. 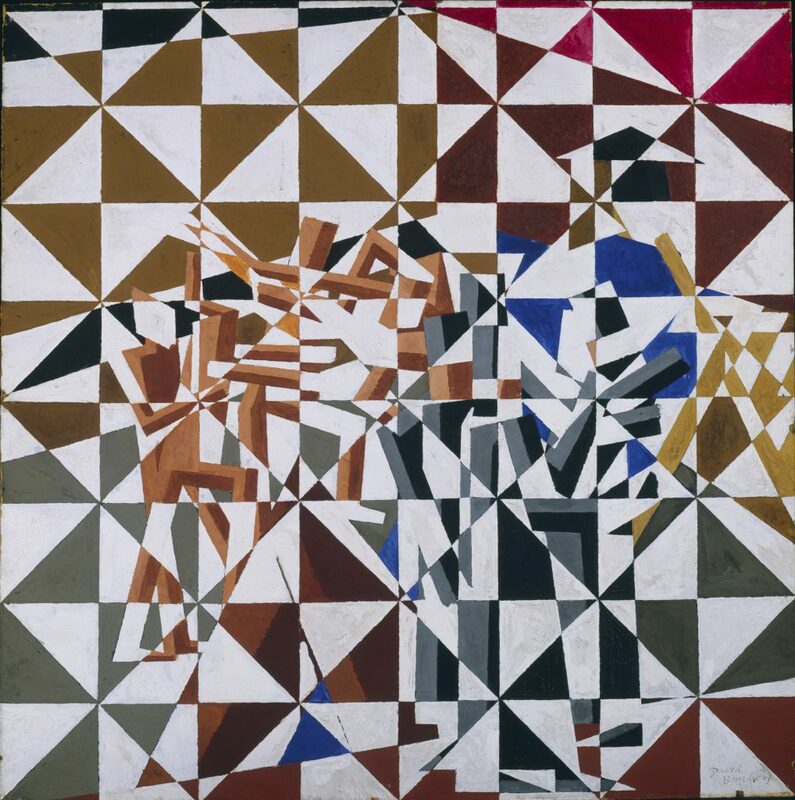 The abstract, Ju-Jitsu, illustrates the influence of European artists work and brilliantly captures Bomberg’s own fractured experience of life as the son of Polish immigrants. 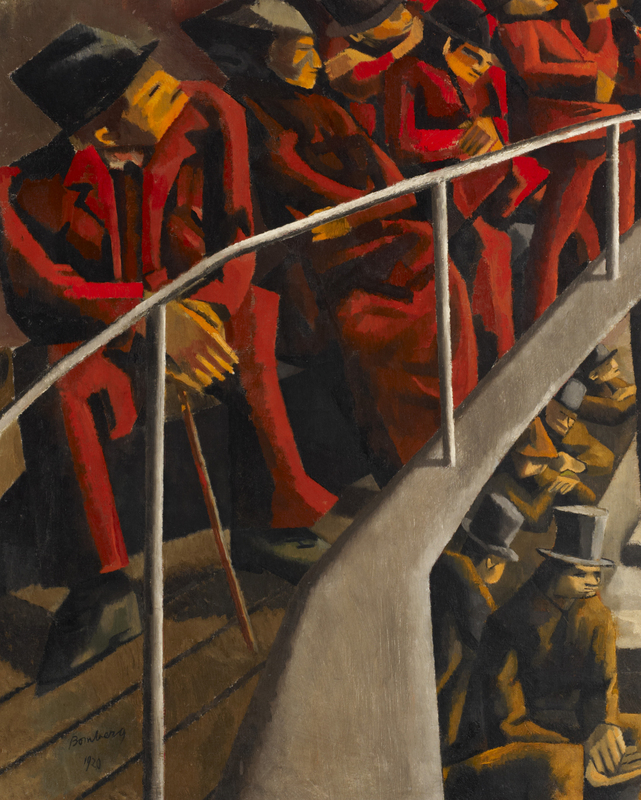 Although Bomberg always distanced himself from them the influence of the English Vorticist movement can be seen in Ghetto Theatre. The vorticist’s cubist fragmentation of reality, with its hard edged imagery derived from the machine and urban environment, is apparent in the lines of seated figures and the austere theatre architecture. The painting also reflects the mood of the artist after his experiences in the trenches of the First World War. 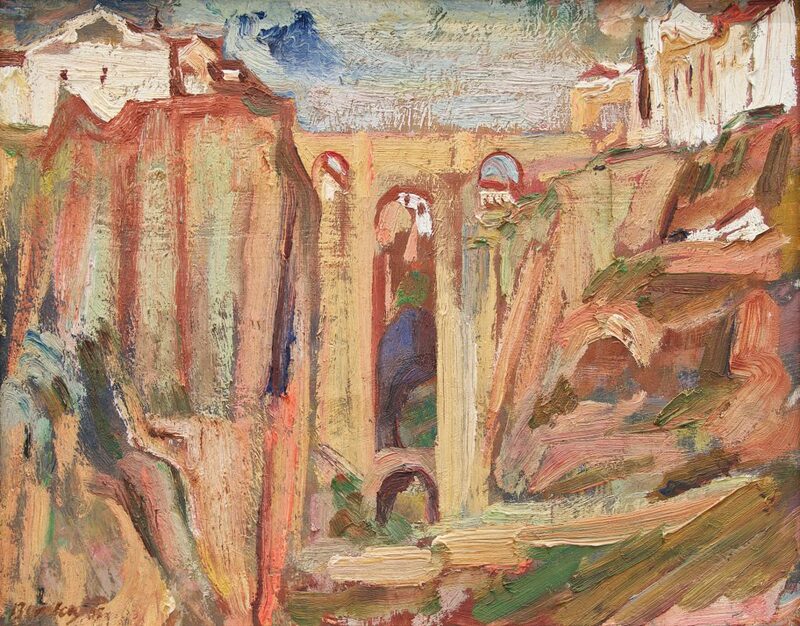 In 1923 Bomberg travelled to Jerusalem where he painted topographically. Working en plein air he painted a series of realist landscapes including Jerusalem city. In 1929 he visited Spain and would return in 1934/1935. These visits inspired a new vigour in his work. His oil Ronda Bridge depicts the gorge and crossing. It is dramatically portrayed, alive with movement. The heat and light of the scene is conveyed in his bold, expressive brushwork and use of colour. This phase of his work was curtailed by the tragic onset of the Spanish Civil War. In the 1930s and 1940s Bomberg painted a series of searching self-portraits. These and a number of studies of his friends display an extraordinary intensity. The show concludes with Bomberg’s moving Last Self-Portrait from 1956, the year before he died. The exhibition provides a strong and insightful narrative to accompany Bomberg’s visually striking work. That it redresses our understanding of this important British – Jewish artist, whose work was often overlooked during his own lifetime, is to be commended. Introducing Bomberg: A Master of British Art runs until 4th February 2018. For more information visit www.pallant.org.uk or telephone 01243 774557.